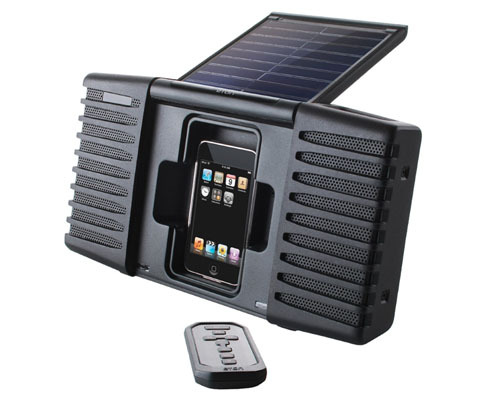 This Solar Powered Charging Dock and Sound System by Eton gives you 4 hours of audio playback at mid-volume and continuous charging of iPod and iPhone in battery mode. It uses two cell lithium ion 2000mAh, 7.4V rechargeable batteries and takes about 10 hours to recharge in direct sunlight (4 hours via AC). Two full-range speaker drivers have a total output of 11W. It is ideal for outdoor use and can be used indoors as well.